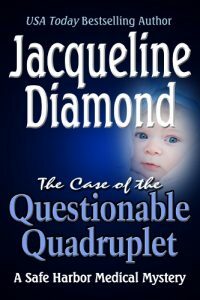 Young, widowed obstetrician Eric Darcy is stunned when the mother of triplets claims to have borne a fourth baby, a quad, that was stolen from her years ago. When someone murders his patient, Eric believes the police are dismissing a vital clue, and teams up with his PI sister-in-law to investigate, never imagining his own life might be in danger. I’ve been eager to return to writing mysteries (my titles include Danger Music and The Eyes of a Stranger). For my 101st novel, I decided to draw on the settings and research I’d done for my 17-book Safe Harbor Medical romance series published by Harlequin for a new, self-published mystery series, The Safe Harbor Medical Mysteries. The idea of a young obstetrician who cares deeply about his patients appealed to me. Of course, I gave Eric Darcy unique quirks and qualities, and a sometimes amusing way of seeing the world. He also has a skeptical best friend who’s a homicide detective, which provides additional opportunities for him to get involved in solving crimes. “I’m glad you think so highly of me.” The raspy voice rang out from the entryway, where a departing guest must have left the door ajar. Like an electric current, the words rippled through the small knot in the atrium. Normally, there was nothing imposing about Rafe Tibbets, who stood about five-foot-eight. This afternoon, though, anger twisted his narrow face and flashed in his pale eyes. Mostly, what held us all motionless was the gun gripped in his hand.